AVONDALE — A 25-year-old Divvy cyclist struck by a flatbed truck at Belmont and Sacramento avenues has died, police and witnesses said. The collision happened about 9 a.m. as the cyclist — identified by the Cook County Medical Examiner as Virginia Murray — rode next to a flatbed truck northbound on Sacramento, said Officer Jose Estrada, a Chicago Police Department spokesman. The cyclist, of Wicker Park, and truck driver both tried to turn east onto Belmont when the cyclist was hit, Estrada said. The woman suffered significant injuries to her upper body and was taken to Illinois Masonic Medical Center, where she was later pronounced dead. Divvy and the Chicago Department of Transportation confirmed in a joint statement that a cyclist on a Divvy was involved in a fatal collision with a truck Friday morning, and expressed "our deepest condolences to the rider's family and loved ones. " The incident is the first-ever fatality within the Divvy system and likely the first time in U.S. history that a bike-sharing rider was killed while on a rented bike. In April, Quartz reported that of the 30 bike-sharing programs in cities across the country, no fatalities had been reported. 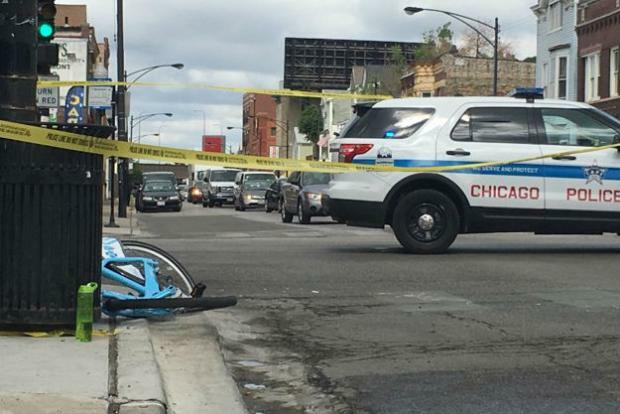 Photos from the scene show the damaged, abandoned sky-blue Divvy bike on the Belmont Avenue sidewalk. Kevin Schroeder, 32, told DNAinfo he woke up to sirens and saw a Divvy bike on the street next to a large flatbed truck. A nurse he spoke to on the scene said it didn't look like the cyclist was breathing when she was put into the ambulance by first responders. Schroeder said the cyclist was not on the scene when he got there, but he said he saw what appeared to be blood on the street. A witness said the cyclist was tossed about 6 feet into the intersection, Schroeder told DNAinfo. Estrada said no citations had been issued to the truck's driver, and the investigation is ongoing. Employees at nearby businesses said they had seen the blue Divvy bike, twisted and mangled, on the corner after the woman was taken away. The intersection was blocked off, and four or five police cars swarmed the area, they said. Leah Knepper, of Wicker Park, was riding her bike past the scene of the accident around 11:30 a.m. She rides her bike every day in the city, she said. "An intersection similar to this, I don't feel safe," Knepper said. "I take extra time to make sure I am an advocate for my own safety. "I never take a chance," she said. There is an active cycling community in the area, Knepper said. Bicyclists passed by the scene of the accident every few minutes. Jim Merrell, advocacy director for the Active Transportation Alliance, said the safety record for bike-sharing programs was "really, really strong," but the group looks forward to citywide initiatives that will make it safer to bicycle in Chicago. “In terms of the tragic fatality earlier today, we extend our condolences to the family and friends of the victim. And this crash is a tragic reminder that there’s a lot of work that remains to be done to ensure everyone using our streets is safe,” Merrell said. Vision Zero is a program that helps cities eliminate traffic deaths. “Every intersection should be safe, and anytime there’s a crash, just a single fatality is one too many,” Merrell said.